The machine adopts the old handmade scaffolding welding process manufacturing. 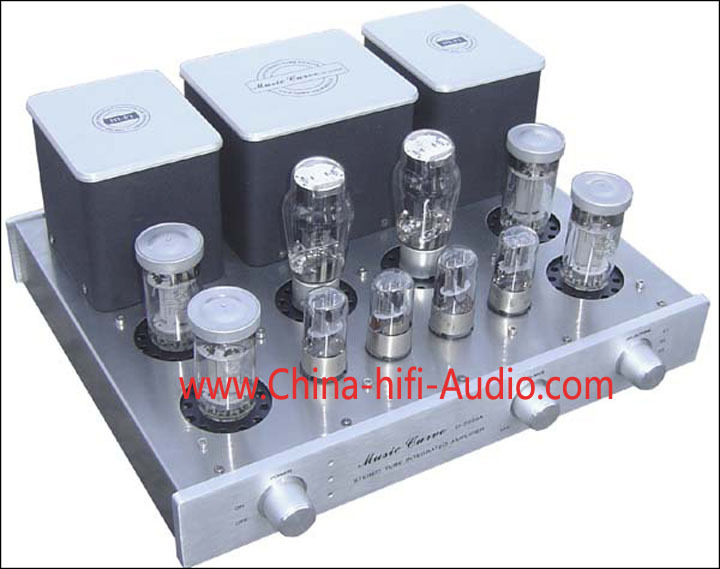 triode form of enlarged, further reducing distortion, more delicate sound. Second level to promote internal parallel twin dual triode 6N8P promote, 6N8P maximum anode dissipation power up to 6W about lower internal resistance in parallel impetus for better. Rectifier with high-current rectifiers 5Z3P × 2 secondary rectification method, high-current amplification makes the CPI by better and more abundant supply. ● using 6J4P (or 6J8P) x 2 and 6N8P × 2 do zoom promote. ● high light metal knob, blue power light (warm-up delay indication). ● 1.2mm brushed stainless steel casing. ● senior the wrinkle paint craft cattle cover. ● quality core layered sub-winding power cattle is also using the same core, high-purity oxygen-free copper wire production output cattle. ● volume sets the production W.L or wizard potentiometer. ● Weimar Germany WIMA red MKP capacitive coupling. ● Teflon silver plated the shielding signal line. ● high-grade gold-plated RCA signal terminal, and stout with oxidation Amber gold-plated binding posts. ● four of import large pond filter. ● three plug power socket, easy replacement fever power cord.